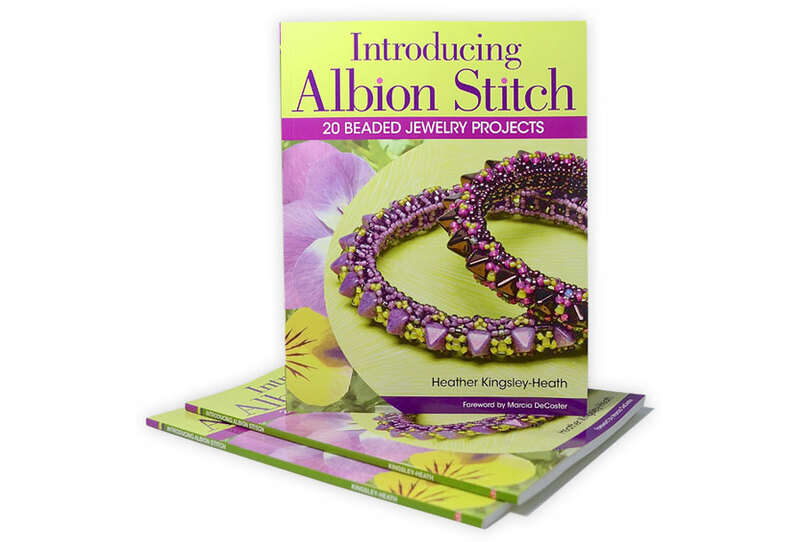 Welcome to the home of Albion Stitch, a beading process I have developed. 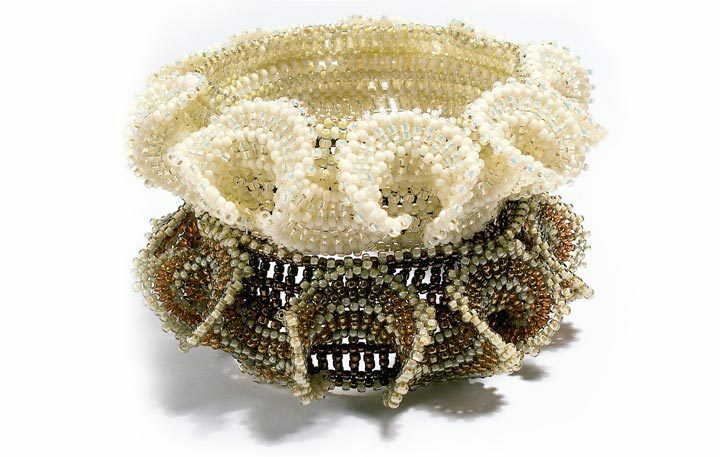 Reviewers have been kind, bead artist Dulcie Heller shared her thoughts on the possible origin of the stitch and showed her exploration of the wave bead in her blog. 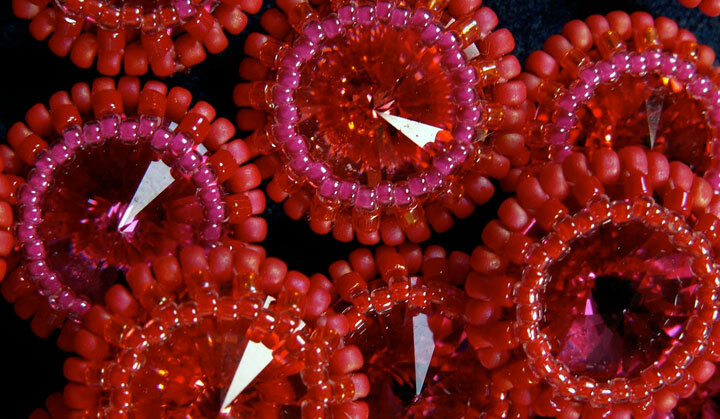 “After 70,000 years of beading can anything we come up with truly be called new? 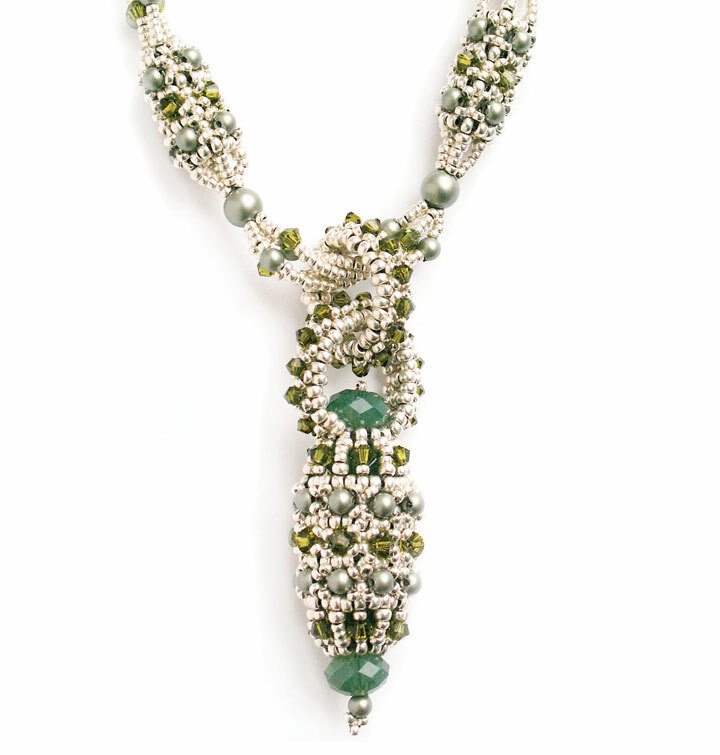 That’s the question the Beadwork staff had been mulling over as we worked on bead artist Heather Kingsley-Heath’s Albertine necklace. But, eventually, we set aside our skepticism. Heather’s piece uses a beading technique that she calls Albion Stitch, and it is, in fact, a stitch we haven’t seen before”. 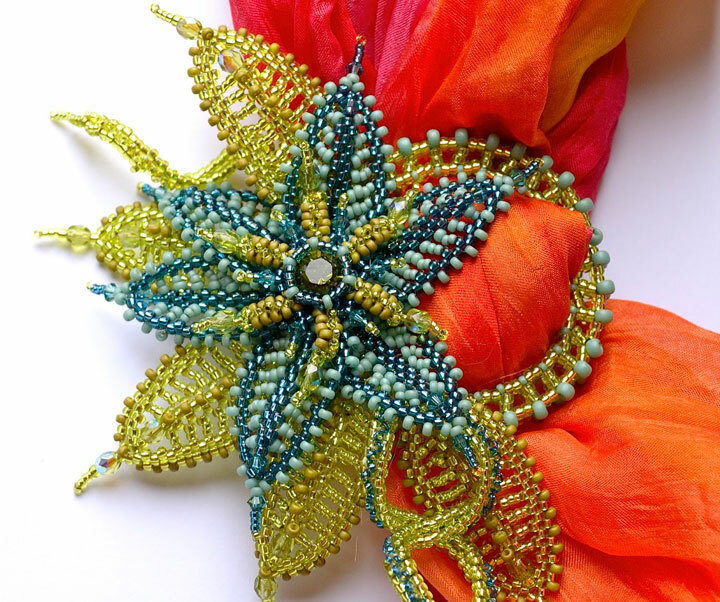 It began when I was beading a freeform brick stitch piece. As a way of growing the piece more quickly; I worked some elongated picot stitches with two bead tops, linking the tops with ladder stitch, to make a new base row for more brick stitch. Slowly a process emerged, ways of increasing and decreasing, of getting the stitch to describe shapes and patterns. Terminology for describing the steps, ways to make it do all the basics that any other beading stitch is expected to do. My beading group tried it, and loved it, so it was time to create a sequential collection of designs, each showing a new step in the process, which became the patterns in book one. The second half of the story was revealed in book two, with techniques for creating bezels, crisp geometric shapes, layered forms and patterns for flowers, insects and leaves. Together, the two books shared the entire process so far developed. 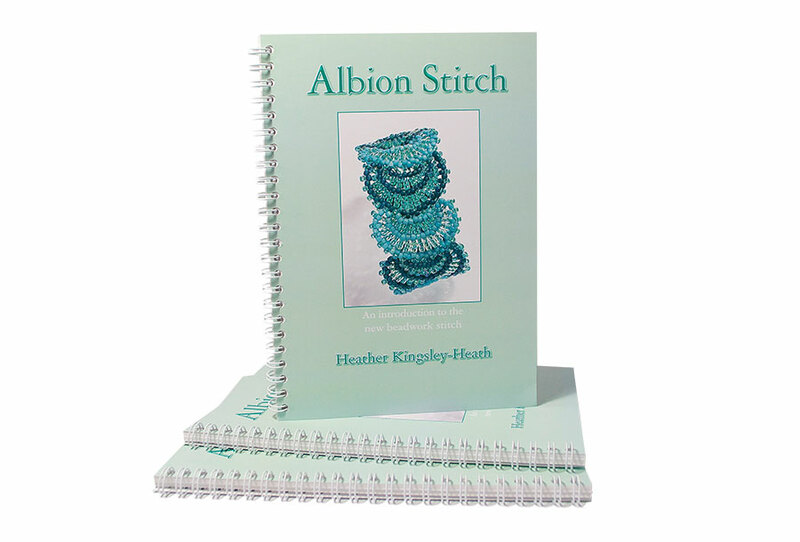 I travel the beading world teaching Albion Stitch, and continue to develop the stitch ever further, with a steady supply new designs for classes and kits. A third book is now available with more new developments. You can find out more in the blog posts and you can order the book from the book section. I have received many requests from designers and students curious about the stitch. 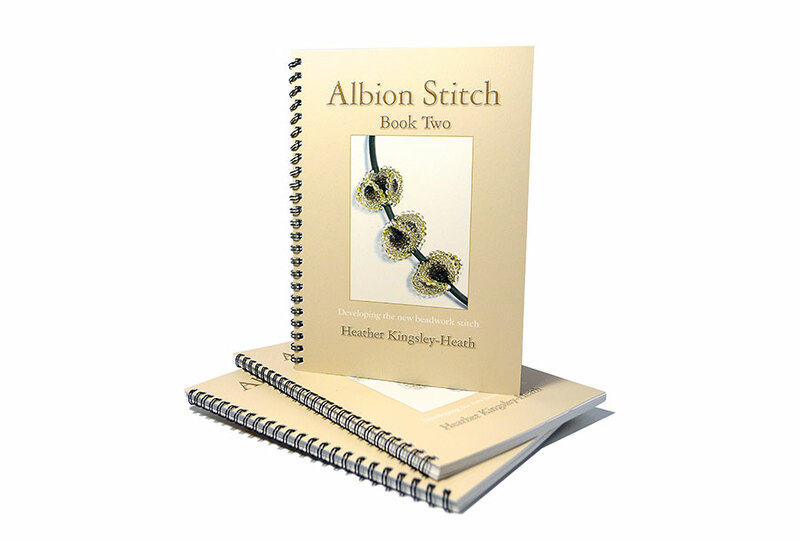 Copyright rules apply to my published designs, but you are very welcome to use Albion Stitch in your work to create new designs, to teach and sell those designs. You are also openly invited to get in touch and share your development of this exciting stitch process. I’d love to show and share news of your work so please feel welcome to contact me via email.